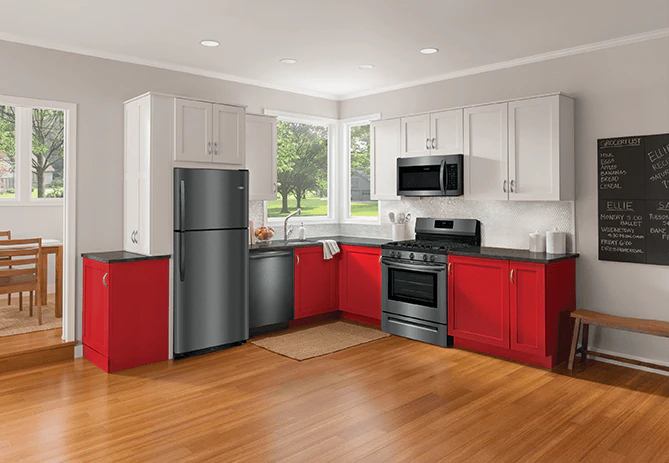 For safety purposes, the door on your Frigidaire oven model FFG3054TD locks during a self-cleaning cycle. Once the process is over, and the temperature inside the oven cools down, the door will unlock. If you tried opening the door after the cycle ended, and it wouldn’t budge, the door latch motor and switch is likely malfunctioning. While this can be alarming at first, it’s actually a fairly easy repair that shouldn’t take long at all. Always unplug your range, and turn off the gas valve before starting a repair. To protect your eyes and hands from sharp objects, please wear safety goggles and work gloves during the replacement process. To reach the defective door latch motor and switch, you must remove the lower, rear access panel. Take the panel off by unthreading the screws that secure it to the back of your range. Once the screws are out, lift the panel up and off your appliance. Before removing the component, take note of where each wire connects by either snapping a photo or drawing a quick diagram. Using a nut driver, unthread the screws holding the motor mounting bracket to the range. The door latch motor and switch is attached to a connecting rod. You will need to tilt the component down to free it from the rod. Once the rod is no longer hooked on to the part, you can pull the motor and switch off the range. Disconnect the wires running to the door latch motor and switch. Now you can get rid of the faulty component and replace it with a functional one. To install the new latch motor and switch, hook the connecting rod into the hole located on the top of the motor. Then, secure the motor’s mounting bracket to the back of the range. Pull out the picture you took or the diagram you drew, and start reconnecting the wires to their proper terminals. Now reinstall the lower, rear access panel with the screws you took out earlier. After the panel is secure, plug your appliance in and turn on the gas supply. Test your new door motor and switch by opening your oven door. If replacing the door latch motor and switch didn’t resolve your oven’s malfunction, please contact us today and we’ll be happy to schedule an appliance repair appointment for you.